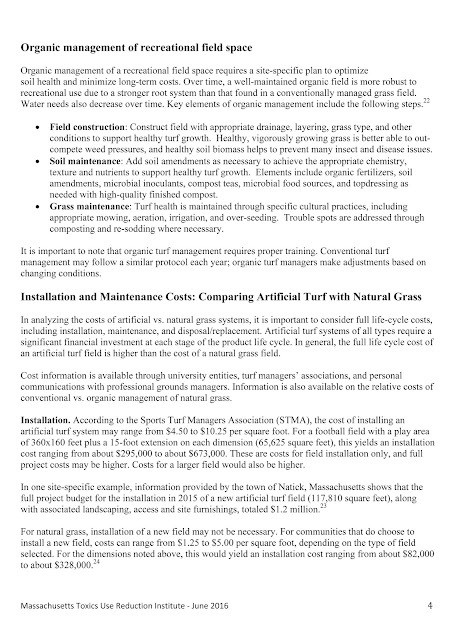 Municipalities, universities, schools and other institutions frequently need to make decisions about maintenance and installation of athletic playing fields. This may include choosing between natural grass and synthetic turf. 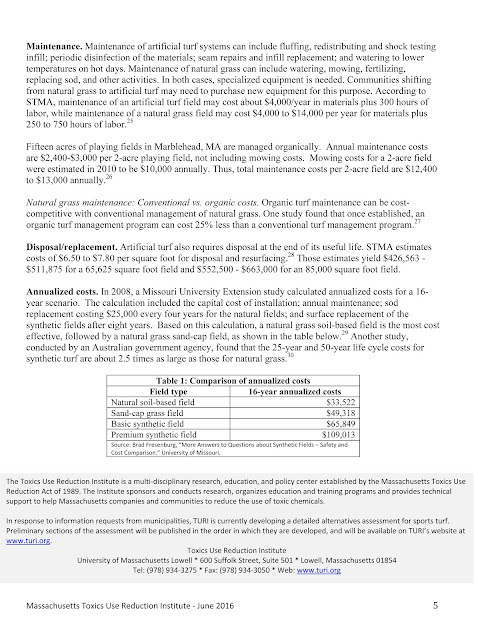 This information sheet introduces some of the considerations that are relevant to evaluating natural grass and artificial turf alternatives, including performance, safety, cost, and potential environmental and health impacts. 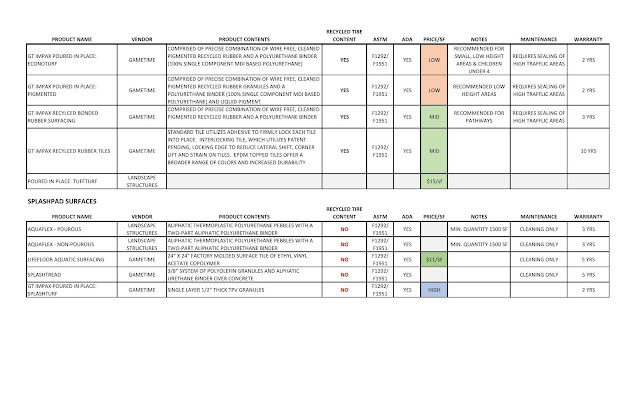 More detailed information all these topics will be available in the Sports Turf Alternatives Assessment. TURI conducts alternatives assessments as part of its overall mission to help Massachusetts companies, communities, and municipalities identify and implement toxics use reduction options that will provide safer solutions to the use of toxic chemicals. 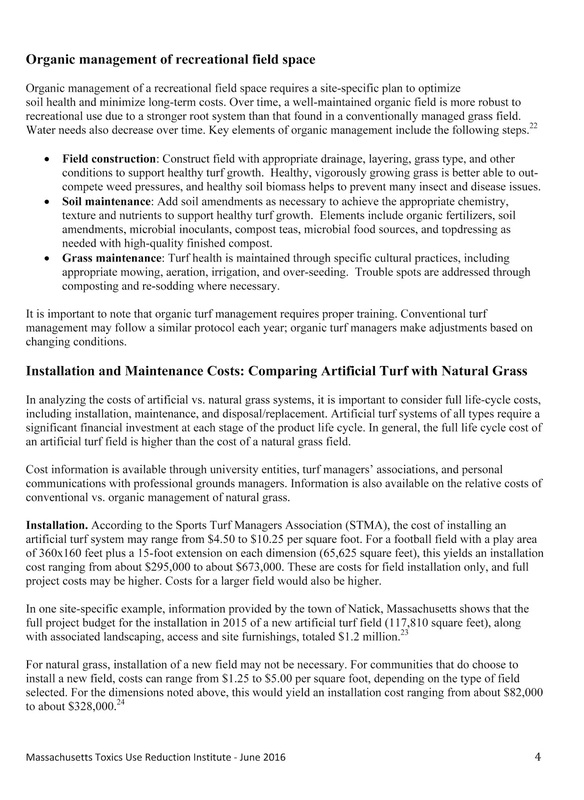 TURI has received numerous requests for information about artificial turf fields as an alternative to natural grass fields. In response, TURI is developing an alternatives assessment for sports turf. 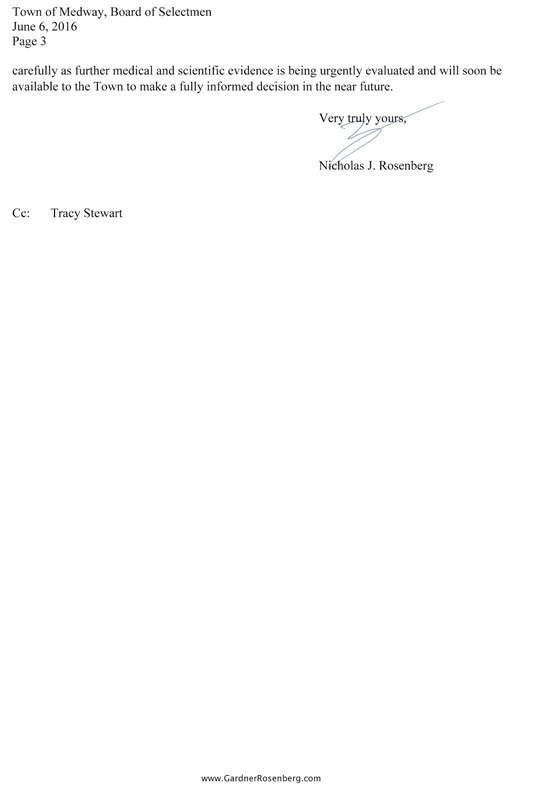 Preliminary sections of the assessment are being published in the order in which they are completed. 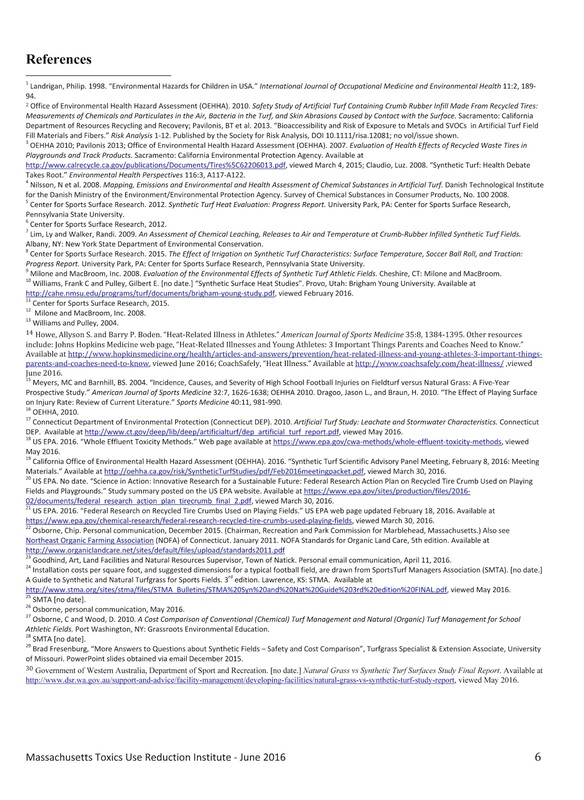 The TURI Library’s Artificial Turf resource guide provides links to reports, articles and press reports related to artificial turf. Residents of Medway will have an opportunity to vote at a special Town Meeting on June 9 whether to issue a moratorium on the use of tire-derived crumb rubber for the next three years. But what exactly does that mean? As a citizen who participated in the petition to bring this issue to a vote, I admit that I did not have much background on the subject of artificial turf and the materials used a few months ago. Since that time, I have done some reading. A lot of reading, actually. And what I have learned has given me pause. Bear with me as we run through a brief history. For decades, our country has faced a growing challenge with a rather mundane problem: what do we do with all the old tires that no one needs anymore? In all honesty, I found it somewhat surprising that no one saw this coming. Everyone who drives a car has to replace the tires at least once, sometimes multiple times, in the life of the car. Did no one think about where those old tires would go? Apparently not, because they began piling up in disturbing quantities in landfills all across the nation. In an effort to address this issue, the U.S. Environmental Protection Agency (EPA) supported the grinding up of these tires into crumb rubber to be recycled in a variety of ways, including on athletic fields and playgrounds. Everything was going well, until concerns began to surface about the toxicity of the crumb rubber. Suddenly the solution to the landfill problem raised another serious question: are there health risks associated with tire crumb? Cases of blood cancers and health problems started cropping up among otherwise healthy athletes who played on this tire-derived crumb rubber. Ultimately, the EPA withdrew its previous endorsement of tire crumb in light of increasing concerns that its safety had not yet been adequately studied. Hang in there with me – the history lesson is almost over. On February 12, 2016, the EPA entered into a three-year action plan in partnership with the Centers for Disease Control and Prevention/Agency for Toxic Substances and Disease Registry (ATSDR), and the U.S. Consumer Product Safety Commission (CPSC) to study key environmental human health questions related to tire crumb. In case I lost you, here’s the short version: the EPA previously endorsed the use of tire crumb as a partial solution to the significant problem of scrap tires piling up in landfills; they have since reversed this position, and will be partnering with other federal agencies to study what impact tire crumb has on human health. Does this mean that tire crumb is harmful? We don’t know. That’s actually the point – no one knows. The study has only just begun, and it will likely take many years before we have more information on the health impacts of crumb rubber. 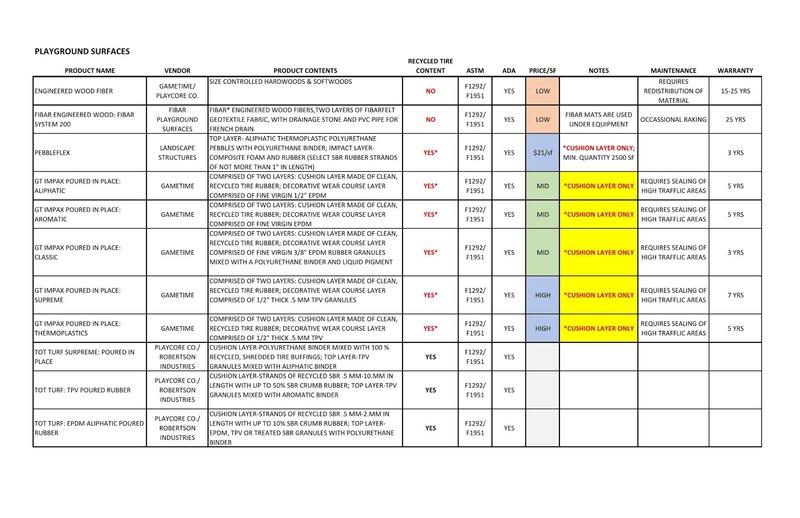 In the meantime, I urge Medway residents to mirror the actions of the EPA, CDC and CPSC, and vote not to use tire-derived crumb rubber on any new surfaces or fields on town land for the next three years while these agencies complete their research. 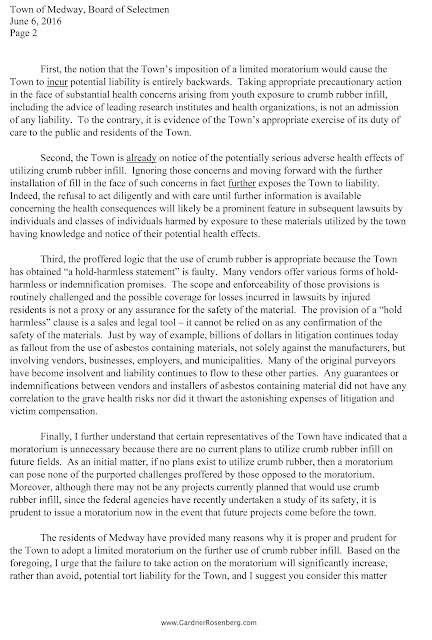 Town officials have repeatedly assured residents that there are no plans to construct any new fields or surfaces using tire crumb, so a “yes” vote on Article 1 would not interrupt any current projects and would ensure that we do not expand our usage of a material that might ultimately be deemed harmful in the future. We don’t know what the federal study will find. Is it worth the risk of knowing that tire crumb could be harmful, that we had a chance to stop further use of it, and we did nothing? Or worse, that we actively voted against it? 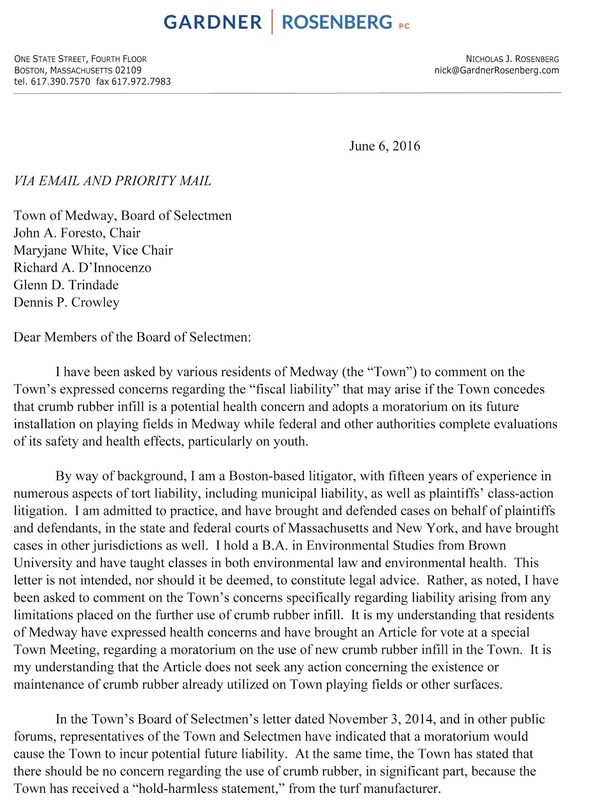 I will be voting in favor of the moratorium on tire-derived crumb rubber on June 9, and I urge the residents of Medway to join me in support. Dr. David Brown, a Public Health Toxicologist. Recipients of the Medway Youth Baseball email should note: The letter attached to the MYB email was addressed to the Town of Concord Massachusetts and notes correspondence to Medway MA. Concord Massachusetts passed a moratorium by way of a citizen's petition on tire-derived materials in April 2016. LETTER FROM DAVID BROWN, Sc.D. Re: Response to the Massachusetts Department of Health concerning their conclusions concerning the safety of synthetic turf fields. I am writing to explain why it is important to protect children's health by avoiding the use of artificial turf fields. The Massachusetts Department of Health letter, sent to the Medway Board of Health, regarding artificial turf provides an excellent summary of the minimal number of the studies that have been conducted to date, attempting to estimate the risk to young athletes of exposure to chemicals contained in artificial turf fields. If you look carefully at each of the studies cited and note the size of the crumb rubber sample tested, you will see the problem. The findings of each of the studies are based on a startling limited number ( 2 to 12 ) actual samples of crumb rubber (each weighing a no more than few ounces) , on small number of fields most without with any testing of the crumb rubber (4 to 6 fields at most). There is no study that is comprehensive systematic assessment of the risk. Instead, a natural experiment is being conducted in which thousands of children are being exposed on playing fields to rubber, 1) known to contain carcinogens and 2) documented to produce cancer in the workers in the tire manufacturing plants. The results of this human health experiment is to determine whether there is enough exposure to carcinogens in the synthetic turf fields to cause cancer in the children who play on these fields. 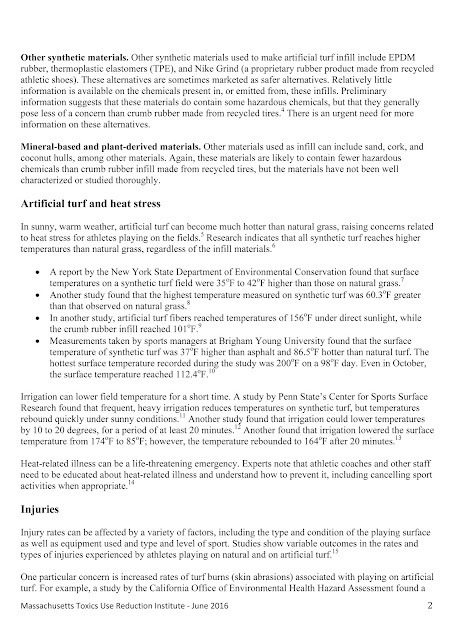 Now that there is strong indication that cancer has appeared in one segment of the student groups that have played on synthetic turf, (soccer goalies in particular as well as others) the experiment is allowed to continue with health departments standing by until they can obtain positively statistical confirmation of the cancer hazard. 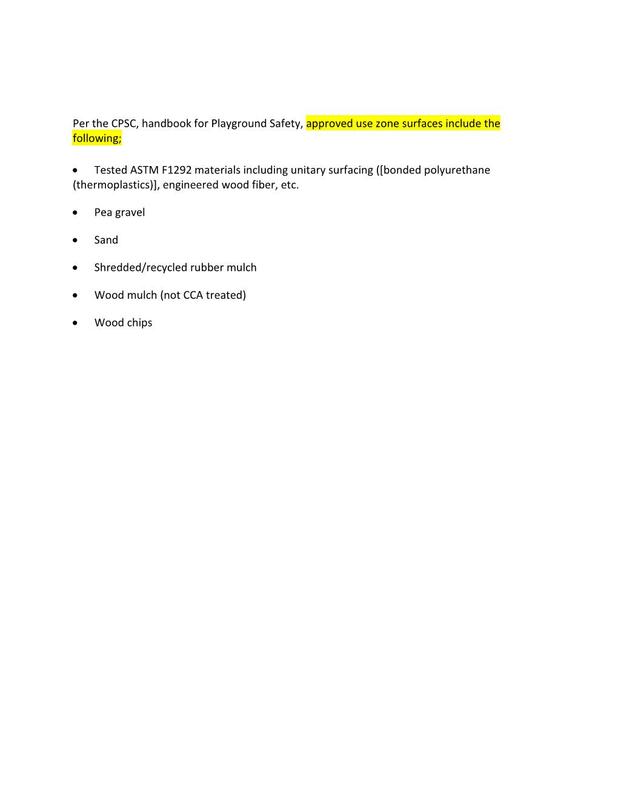 Crumb rubber infill contains a large number of chemicals known to be toxic to humans. These include chemicals associated with cancer, asthma, and other adverse health effects. There is no "safe" threshold level for exposure to carcinogens. The only way to eliminate cancer risk from these chemicals is to eliminate exposure. 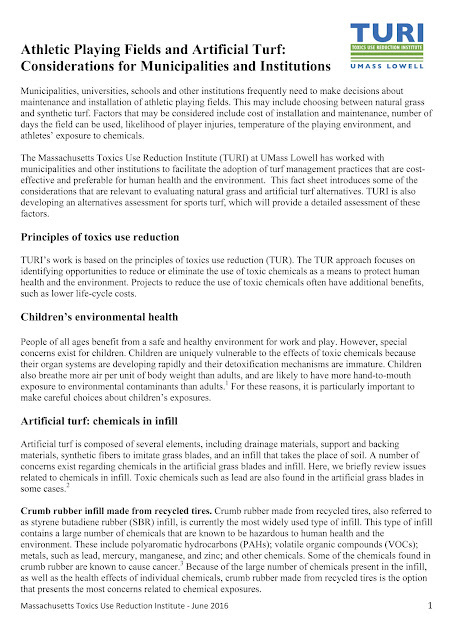 No existing study disputes the inherent hazard of these chemicals; the studies simply draw varying conclusions regarding the total amount that these chemicals pose to children who are likely to be exposed when they play on the artificial turf fields. The bottom line is that nobody knows exactly what the mix of chemicals is in any given field containing crumb rubber made from recycled tires. Tires themselves are manufactured with a wide variety of chemicals. Fields may contain tires from a variety of sources, and there is no source of information to identify exactly what chemicals, and in what quantity, are present in any given field. No entity providing the crumb rubber provides any quality control, identification of source, or analytical analysis of the contents of the rubber used. Children are more susceptible than adults to a variety of environmental hazards, for several reasons. Children's organ systems are developing rapidly. A toxic exposure during a critical window of development can have life-long consequences. Children's detoxification mechanisms are also immature, so an exposure that might not have an important effect on an adult could have an important effect on a child. In addition, children have many years in which to develop disease. Cancer, in particular, is a disease with long latency: disease can develop many years after exposure. For this and other reasons, it is particularly important to avoid carcinogenic exposures during childhood. There has been no comprehensive assessment of the data on cancer among athletes exposed to crumb rubber from artificial turf exposures. However, the evidence collected to date indicates a basis for concern and an urgent need for closer scrutiny. Most notable is the that the ratio of lymphomas and leukemia is the reverse of that expected in the general population for that age group. Such a reverse in the pattern of cancers present is considered a signal that an active chemical carcinogen is present. Given the high stakes, it is prudent to take action to protect children from this known hazard rather than wait for definitive evidence of harm. for Disease Control and Prevention (CDC) in Atlanta, Georgia. Medway Youth Lacrosse sent out an email to it's subscriber's list on June 7th. The petitioners have collaborated to answer some of the questions posed in Medway Youth Lacrosse email, our responses are in green, links in blue. Subject: We need your support: Special Town Meeting on 6/9! 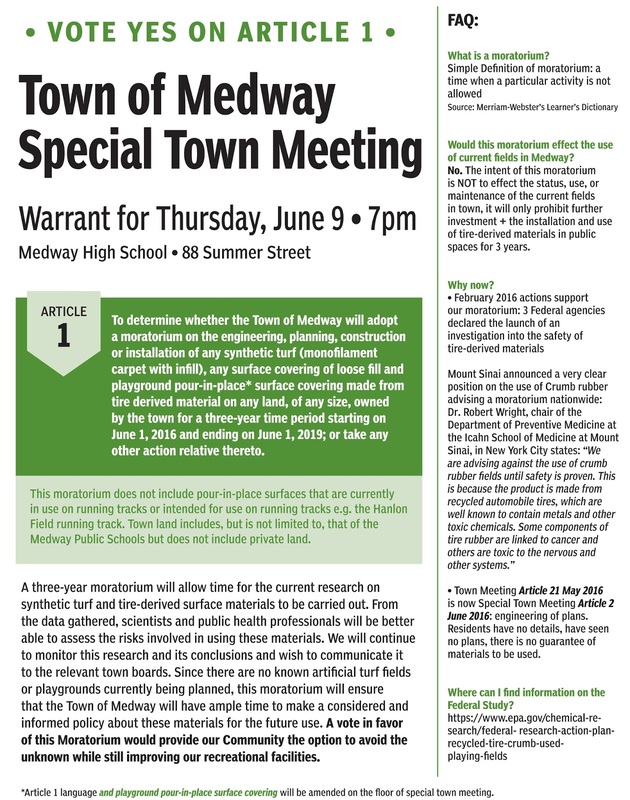 There is a special town meeting being held at the Medway HS on 6/9. We are asking for your support and attendance as there is an article that is very important to the youth sports programs in Medway. The proposed article would put a moratorium on building and construction improvements too our new turf fields: This is incorrect. In a meeting and discussions with the Town of Medway in early May, the petitioners agreed to include language in the article to clarify that Article 1 does NOT affect the maintenance, repair or use of current fields is to be inserted into the article on the floor through our main motion. This Moratorium addresses NEW construction, NOT existing fields. Citizen’s main motion will include a strike of the playground pour-in-place language as noted above. Language to clarify that Article 1 does NOT affect the maintenance, repair or use of current fields will be inserted into the article on the floor through our main motion. With regards to building of new fields: The best time to say you are not going to do something, is the time when you don't intend or plan to do something. Even though tire crumb rubber sport and play surfaces are widely played on, little is known about their risks to health and safety -- especially to vulnerable populations, like toddlers, and to participants with especially high exposure who come in frequent contact with the tire-derived rubber infill. 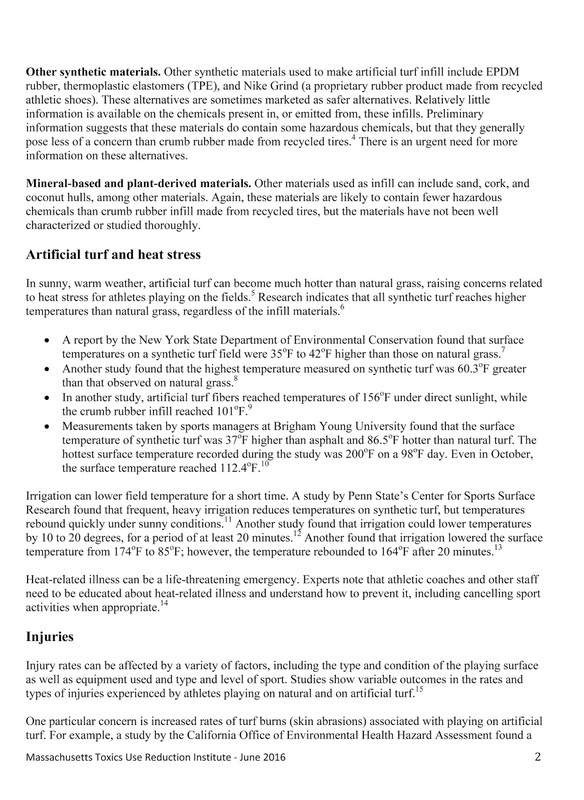 To date, studies on the health effects from exposure to tire-derived crumb rubber have only been partial assessments or did not accurately reflect realistic playing conditions. In February 2016, Mount Sinai announced a very clear position on the use of Crumb rubber advising a moratorium nation-wide: Dr. Robert Wright, chair of the Department of Preventive Medicine at the Icahn School of Medicine at Mount Sinai, in New York City states: "We are advising against the use of crumb rubber fields until safety is proven. This is because the product is made from recycled automobile tires, which are well known to contain metals and other toxic chemicals. Some components of tire rubber are linked to cancer and others are toxic to the nervous and other systems." Is there a risk of suspending use? The petitioners are not suggesting suspending use of the current fields, Article 1 simply pauses the use of any more tire-derived materials for 3 years, on NEW creation only. The current fields will be open for use, repaired or maintained and replenished as the Town and various sports groups see fit. Could we potentially have to stop using these fields completely? ANSWER from PETITIONERS: No, Article 1 does not affect the use of the current synthetic turf fields in the Town of Medway. Until the Federal agencies complete their study, there is no advisement or direction from the Federal agencies on use of current fields. Does this now imply that the Town of Medway acknowledges some sort of health risk? ANSWER from PETITIONERS: No, this is a citizen’s petition of fellow parents and residents. A vote YES would simply pause any NEW engineering, planning, construction or installation of tire-derived loose material for three years. Is there any potential financial liability to the Town as a result of this if passed? 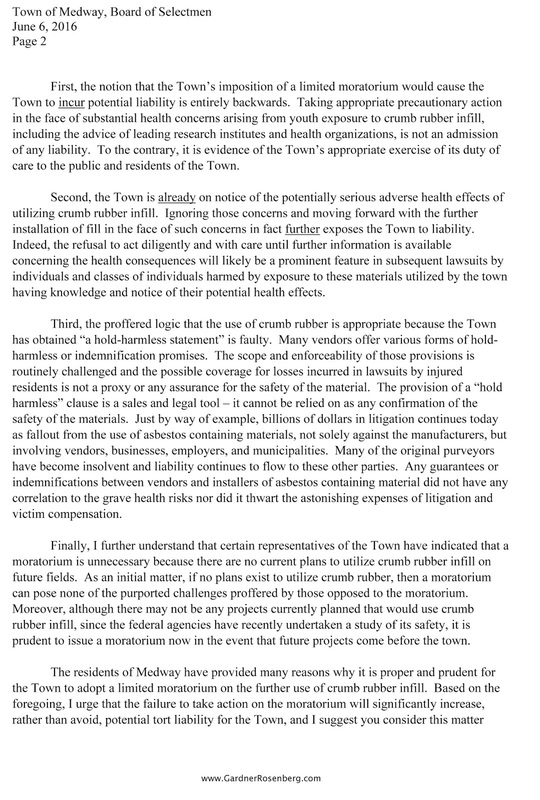 ANSWER from PETITIONERS: We suggest this question be answered by the Town of Medway Finance Committee, at this time (June 7 2016) there has been no response from Town Legal Counsel on the fiscal liability question. The petitioners believe that the potential financial liability to the town would be greater if the Federal Government/EPA comes out with guidance that negatively impacts the use of tire-derived loose material without the moratorium in place. Additionally, the main concern of the petitioners is the health and safety of our children. A three-year moratorium will allow time for the current research on synthetic turf and tire-derived surface materials to be carried out. From the data gathered, scientists and public health professionals will be better able to assess the risks involved in using these materials. We will continue to monitor this research and its conclusions and wish to communicate it to the relevant town boards. Since there are no known artificial turf fields or playgrounds currently being planned, this moratorium will ensure that the Town of Medway will have ample time to make a considered and informed policy about these materials for the future use. A vote in favor of this Moratorium would provide our Community the option to avoid the unknown while still improving our recreational facilities. Please take an hour Thursday night and come and be heard. We spent a lot of state and town money to create great facilities that are now the envy of our neighboring towns. It would be a shame to risk that because we are unaware or too busy to attend this meeting. We hope to see you Thursday night! 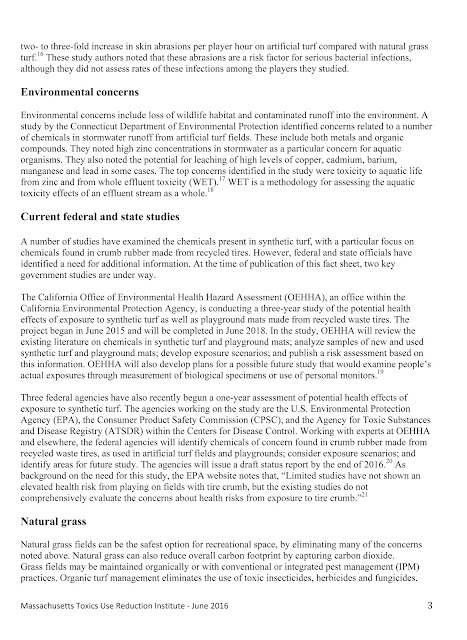 On February 12, 2016, the U.S. Environmental Protection Agency (EPA), the Centers for Disease Control and Prevention/Agency for Toxic Substances and Disease Registry (ATSDR), and the U.S. Consumer Product Safety Commission (CPSC) launched a multi-agency action plan to study key environmental human health questions related to crumb rubber exposure. In April 2016 a group of concerned parents from Medway got together and filed a citizens petition (Article 1) which would put a three-year moratorium on the installation of synthetic turf with crumb rubber infill in the town. 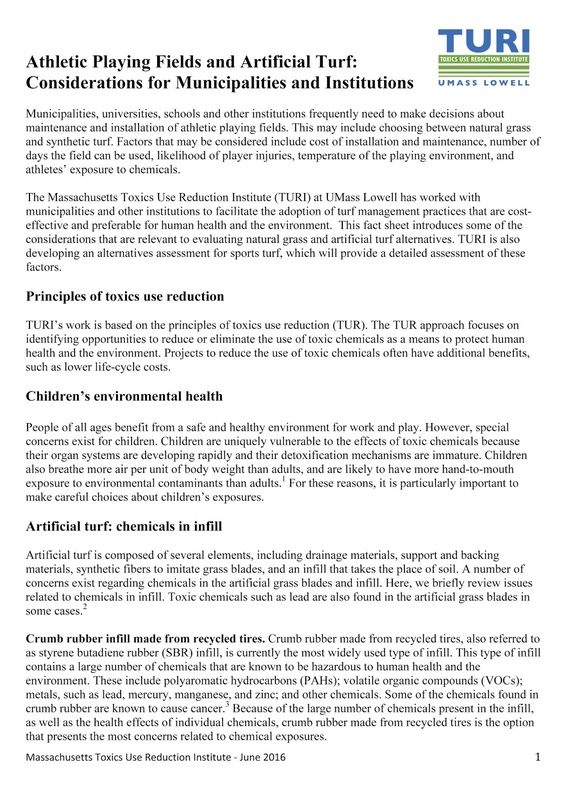 Their goal is to obtain more information about the long term effects of tire derived crumb rubber infill and its potential effects on the children that play on these fields. For the record I am not a scientist, researcher or doctor. I am simply a concerned parent of three school-aged children (10, 9 and 5 years of age) who play sports regularly. I do not know what the results of the EPA study will be but I see NO downside to approving a temporary halt of any further installation of tire derived crumb rubber until we have a better idea of the long term impact to our children. 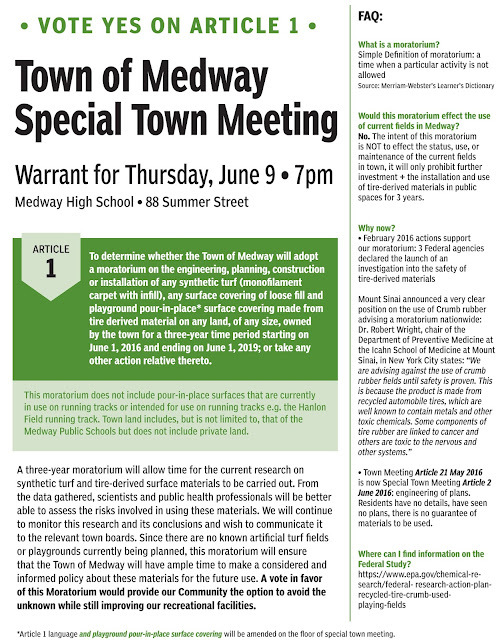 On Thursday, June 9, the residents of Medway will vote on Article 1, which will put a 3-year moratorium on the engineering, planning, construction or installation of any synthetic turf (monofilament carpet with tire derived infill). What does this mean? Voting YES on the article only affects the future use of tire-derived crumb rubber, nothing more. Existing fields can still be used and public parks projects can still move forward using alternative materials. I urge all Medway residents to vote YES on Article 1 to allow the EPA the time to research this topic more extensively. On Crumb Rubber Moratoriums: is there "fiscal liability" ? Playground Surfacing - What are the options? Residents in Medway, MA still have questions regarding the confusion surrounding Article 1, which goes to vote June 9, 2016. The article is for the adoption of a moratorium on any tire derived products for the next three years until the research that has been mandated related to crumb rubber is concluded. Some residents and town officials mistakenly thought the moratorium would affect Article 2, which intends to upgrade many parks and playgrounds areas in our town. The following information may be helpful to other communities as they contemplate what products to utilize for similar improvements over the next 3 years. 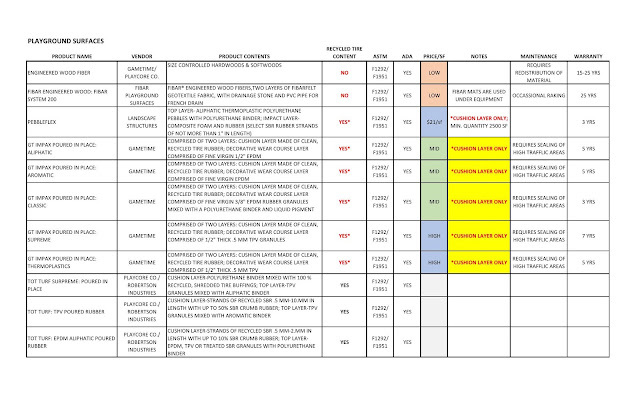 One document states all the legal requirements for compliant surfaces for playground spaces. The information is taken directly from the regulations and agencies. 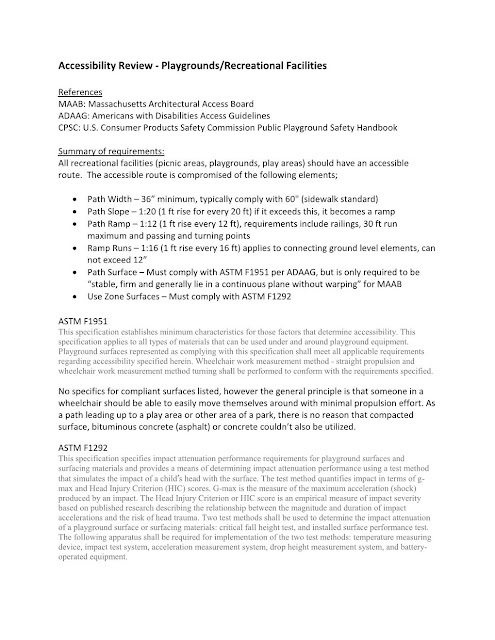 The second document is a compilation of various surfacing materials and indicates various factors - materials, recycled rubber content, ASTM testing, ADA compliance, cost and other applicable information. It is by no means the limit of materials - there are many more available for use, and focus was on the tested products noted in the CPSC list. It was meant to let our residents know that when time comes to pick surfaces for the playground projects, which hopefully move forward, there are MANY COMPLIANT OPTIONS, of varying costs! It also very clearly states that there are NO aquatic products that utilize recycled rubber. I am hopeful that my fellow Medway residents find this information helpful in making a decision this coming Thursday. The information reinforces the message that voting YES for Article 1, is a smart pause as we wait for science to catch up with the products and voting YES for Article 1 will not affect Article 2, which I also plan to vote yes for. Andrea Kerr is a registered architect that has been designing hospitals for almost 20 years. Accessibility is part of her every day, as are the associated regulations. All information is taken DIRECTLY from manufacturer CSI (specifications) with supplemental information from discussions with reps. Any items in a grey tone were not able to be filled in as of this posting.